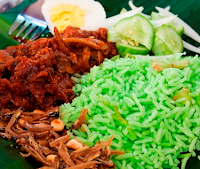 Recipes How to Make Nasi Lemak Pandan Gurih .Residents wilt have the typical dishes of processed rice which became the staple food such as nasi lemak. Nasi lemak is the result of rice cooked the way mixed with coconut milk and seasonings to produce a savory taste of rice. Rice is the hallmark of native culinary Malaysia and is also found in several regions in Indonesia such as Riau and Riau Islands is usually cooked for serving breakfast in the morning. While processed food such as rice concoction is better known as coffè by people in Jakarta and surrounding areas. But it would be very different too salty flavor Malay nasi lemak with coffè betawi and that is the peculiar. In manufacturing, the nasi lemak also dikreasikan with a blend of pandan leaves later called nasi lemak pandan, which is rice cooked with coconut milk, flavoring and water added pandan leaves made ​​from slices of pandan leaves are mashed berama a little extra water. You who want to enjoy a full breakfast by eating nasi lemak pandan can try to make it by following a few stages of the presentation as the recipe how to make a tasty nasi lemak pandan below. At first cleaned and sliced ​​pandan leaves up into several parts. Put it into a blender, add water to taste and puree. Pour the results blenderan sliced ​​pandan leaves that have been refined into a container while filtered so that the waste is not getting carried away. Set aside. Rice soaked for ± 60 minutes in length then ditisikan and washed clean again. Prepare raicecooker then pour the rice that had been cleaned in the rice cookers. Add the coconut milk kara fast food, salt, water and pandan water. Turn risecooker until rice turns into aron rice and steam cooked. Nasi lemak panda ready to be eaten. The side dishes that can be paired with nasi lemak can beripa grouse fried fish, chicken taliwang, fish fry and chili and cucumber slices. Menu dishes other than those mentioned above can also be presented as a companion nasi lemak pandan. All depends on your taste and preference. 0 Komentar Untuk "Recipes How to Make Nasi Lemak Pandan Gurih"